Star Liana York, Bluebird Vessel, Bronze, 7" x 4" x 4"
The first time sculptor Star Liana York shaped clay into a human figure large enough to have a clear facial expression, she was surprised by what she saw in that face. It led to a realization that radically changed her approach to art. The revelation was momentous for York, whose widely collected bronze animal and human figures are admired as much for their lively sense of character as for their accuracy and graceful lines. While infusing a sculpture with personality was a pivotal experience for York, working with her hands was nothing new. Nor was her lifelong affinity for animals – a passion that led her into sculpting in the first place. Even at a very early age, according to her mother’s stories, young Star could be found hovering close by whenever there was a new litter of puppies or kittens near the family’s rural Maryland home. A few years later in her father’s workshop, she drew animal shapes on wood, cut them out with a jigsaw, filed down the edges, and painted them. In high school, York and her sister pooled $250 from babysitting and odd jobs to buy a horse, saddle and bridle. The two girls happily shared the horse, which was followed by many others in the artist’s life. This is evident in the creative yet practical design of her studio, which is just a short walk from the northern New Mexico home she shares with her husband, stone sculptor Jeff Brock. On a warm summer day the studio doors are open wide to the world. A concrete porch, which doubles as a loading dock for sculptures, rises several feet above a lush green field that extends to a line of cottonwoods along the Rio Chama. The couple’s horses often amble up to the porch for a visit. Seen grazing or running in the field, the breeze in their manes, the animal’s fiery and playful equine spirit provides inspiration for the sculptor’s art. Star Liana York, Purrfect Lazy Days, Bronze, 11" x 36"
Horses have been among York’s primary subjects for many years. In addition to her lifelong love of the animals – she rides every day – she finds they offer the sculptural interest of physical solidity combined with fluid lines. Yet beyond the visual, horses share many thousands of years of history with humankind. In ancient times, York notes, before they knew human weight on their backs, horses meant food and clothing for nomadic people – thus, the creature’s central place in the earliest examples of art, found painted on cave walls by Paleolithic man. 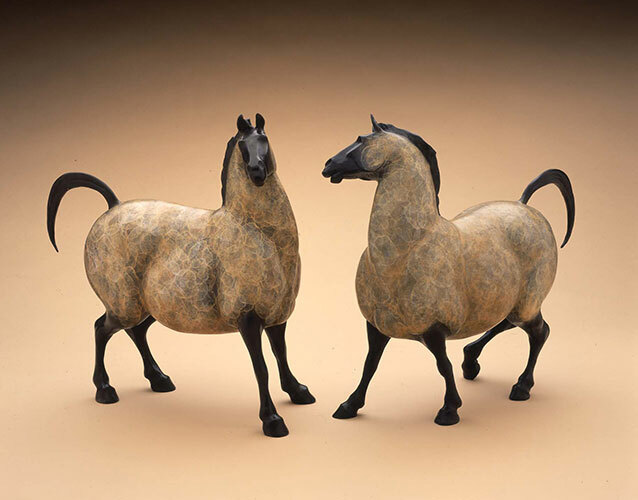 York’s sculpted horses include smooth, “roly-poly” mares with the stylized coloration and look of rock art – such as Sassy and Coquette – as well as horses with a more straightforward, representational feel. As in all her art, her goal is to imbue each piece, regardless of style, with character as distinctive as the individual animal. This goal can be traced back to the realization York experienced while carving the medicine man for the Smithsonian. It also has roots in another, earlier memory that had an important effect on her work. 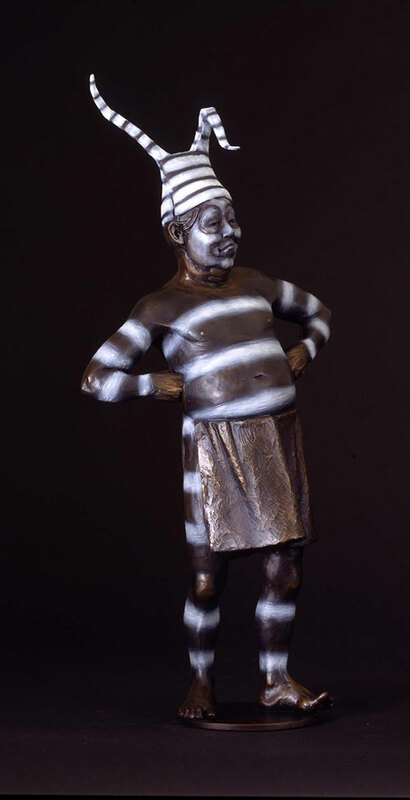 Star Liana York, Mr. Big Stuff, Bronze, 21" x 10" x 5"
As a child, York pored over photos in National Geographic, studying the images of exotic wildlife and tribal people in Africa. She remembers having the impression that the Africans in the magazine were almost another species, so posed and expressionless were they, and so unlike anyone she personally knew. Then her uncle, a schoolteacher and “closest anthropologist,” took a sabbatical and traveled to Africa, living for a time with a bushman and his family in Botswana. He brought back photos of people he’d met. These photos elicited a very different response in young Star. 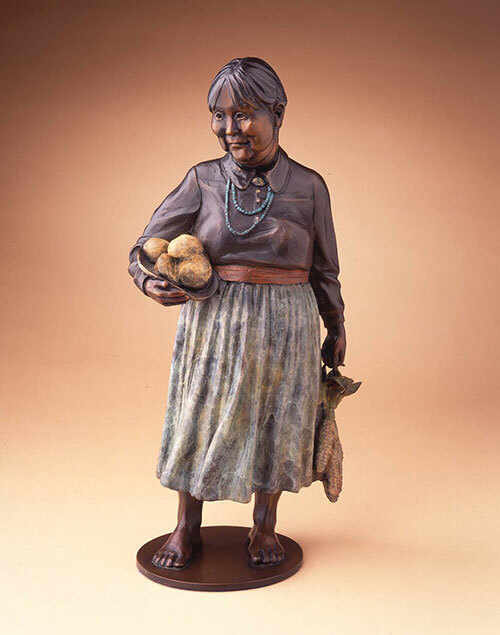 Star Liana York, Feast Day, Bronze, 15" x 7" x 3"
“When I saw his pictures, the people in them became real people. I could imagine them as someone, like my grandmother or a friend. My uncle looked for and captured those telling moments and gestures that revealed people’s personality and character. That’s what I hope to achieve with my sculpture. “I love the anonymous quote that goes: ‘A man who works with his hands is a laborer. A man who works with his hands and his brain is a craftsman. And a man who works with his hands, his brain and his heart is an artist.’ So, as artists, if we’re going to do something worthy of a permanent medium, we need to give it heart. York’s versatility is evident in the many series of works she produces. Her website lists seven different categories: equine, western, Native peoples, ancestral (rock-art inspired pieces), wildlife, and “spiritual liaisons.” The latter includes ritualistic vessels and fetish-style animals incorporating stone sculpture by her husband. These pieces speak to the earth-based, often shamanistic forms of spirituality common among traditional Native cultures of the Southwest. Ravens, wild mustangs, bobcats, mountain lions, and wolves are part of York’s Wildlife of the Southern Rockies series. 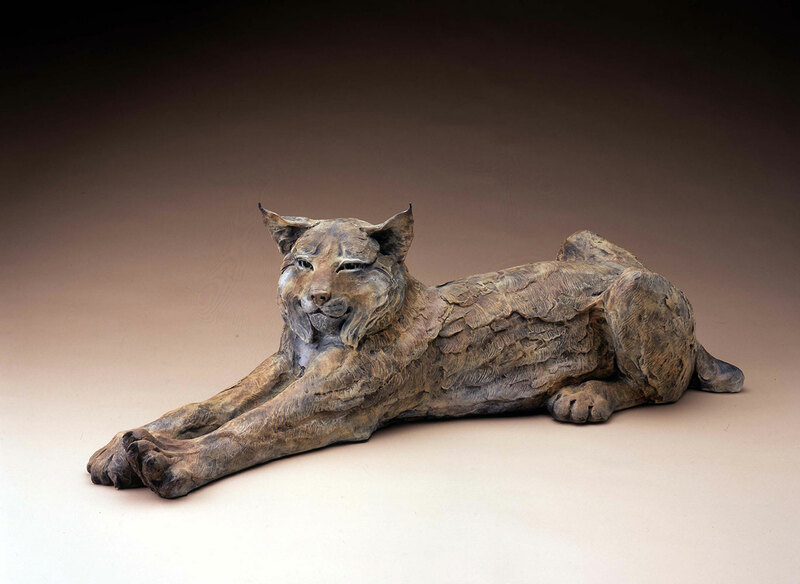 These works pay tribute to animal indigenous to the part of the world the sculptor has called home for nearly 25 years. 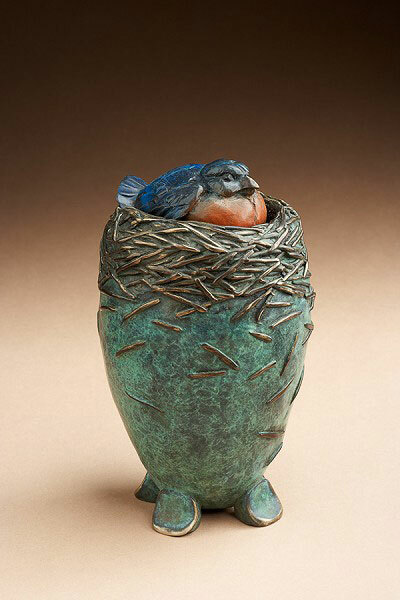 She moved to New Mexico in 1985 to be near the Western Studio-Foundry in Santa Fe. 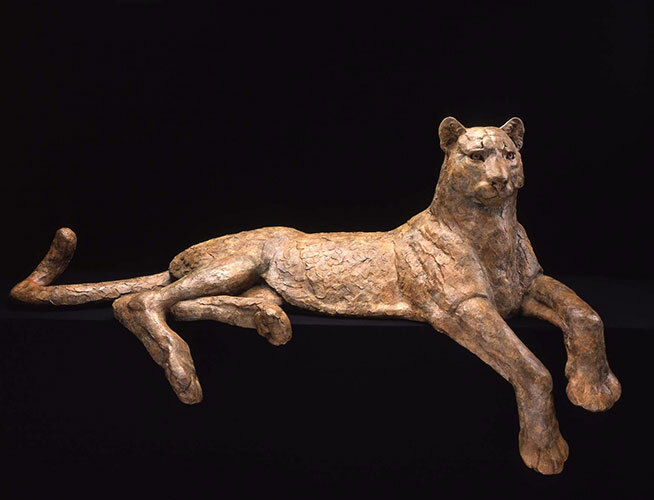 Star Liana York, Regal Repose, Bronze, 39" x 75"